A still from The Orphan of Zhao. Wang Xiaoying features a strong modern sense and unique expression of the cruelty of vengeance in the Sino-Greek bilingual version of the play. 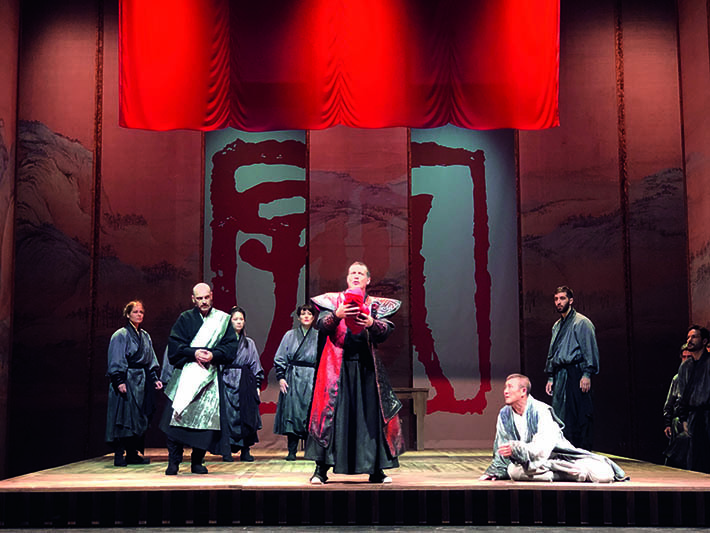 The Orphan of Zhao, considered the Hamlet of classical Chinese literature, was staged at the National Theater of Greece from November 18 to December 2, 2018. Chinese and Greek artists performed one of China’s greatest tragedies in their respective languages. And for the first time, a Chinese director instructed professional actors in the national theater of a Western country on telling a Chinese story. The Orphan of Zhao is a zaju (“variety play”) opera attributed to Ji Junxiang, a Chinese dramatist from the Yuan Dynasty (1271-1368). It is a well-known tragedy from ancient China. The Records of the Grand Historian, written by historian Sima Qian of the Han Dynasty (202 B.C.–220 A.D.), contains a chapter on the events endured by the Zhao family in the Spring and Autumn Period (770-476 B.C.). Minister Zhao Dun and General Tu’an Gu were two of the most influential subordinates of Duke Ling of the Jin State. Tu’an Gu framed Zhao Dun and slaughtered 300 members of the Zhao family. Soon thereafter, a decree was forged to order the death of Zhao Dun’s newborn grandson, orphan Zhao Wu. The child was entrusted to physician Cheng Ying who worked for the Zhao family. Cheng Ying consulted retired Minister Gongsun Chujiu and decided to sacrifice his own child to save the Zhao orphan. Cheng raised the orphan early on, and since General Tu’an Gu lacked any children of his own, he eventually adopted the Zhao orphan without knowing his identity. At the age of 20, Zhao Wu killed Tu’an Gu to avenge his family. Based on historical records, Ji Junxiang flavored the script with imagination and fiction to create strong dramatic conflict with stunning aesthetic effects that touched the hearts of countless Chinese people for centuries. The story has inspired dozens of adaptations, including those by Voltaire and William Hatchett. It won a worldwide reputation comparable to Shakespeare’s Hamlet. 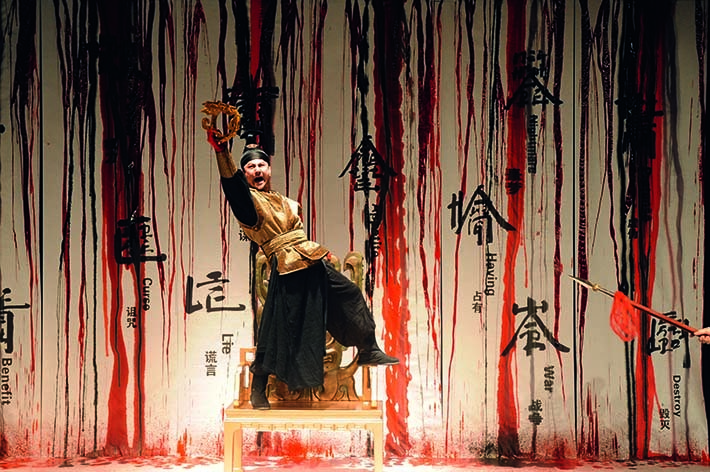 When contemporary Chinese dramatists adapt The Orphan of Zhao, vengeance is always the theme. Modern values question “an eye for an eye,” but both herbalist Cheng Ying and the Zhao orphan review the bloody past and accept the cruel reality before they struggle with the dilemma of seeking revenge or letting the past go. A still from The Orphan of Zhao. 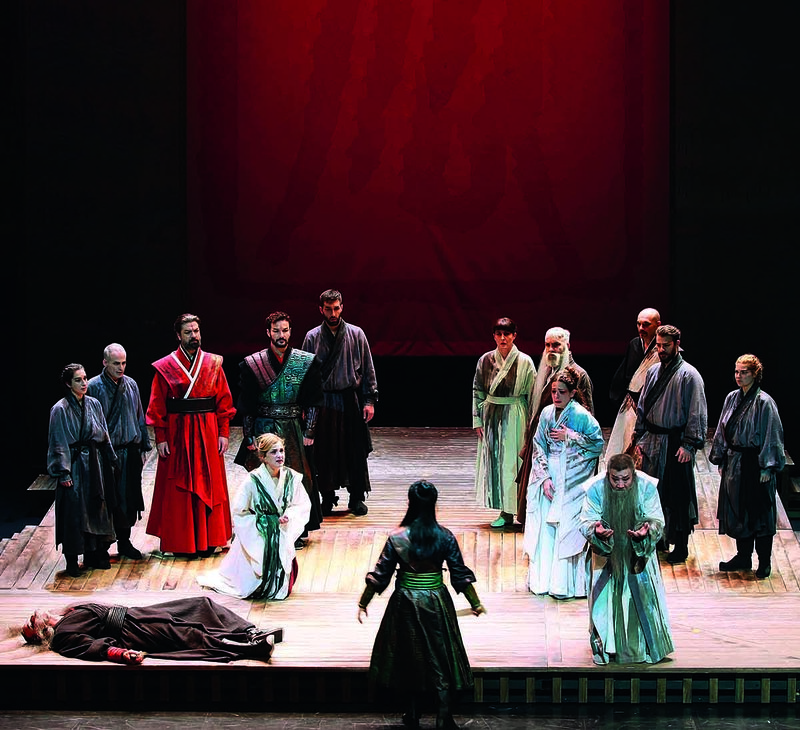 Chinese and Greek artists performed the tragedy in their respective languages, complementing each other to create a unique artistic style in the play. In this adaptation of the play, Cheng Ying no longer shoulders the traditional sense of “morality.” He makes a promise to “rescue orphans” as an ordinary doctor until the situation forces him to sacrifice his own son and start taking steps to embark on the tragic road to becoming a hero. Cheng has the most motivation to seek revenge, but it is he who really reflects and eventually stops himself. Giving up on the idea of revenge requires great kindness, which has become the contemporary interpretation of traditional virtues and a traditional solution to the contemporary dilemma. But can traditional virtues really solve the difficulties of today? An unprecedented ending was designed for the bilingual version of The Orphan of Zhao: At first, the orphan cannot bring himself to kill his adoptive father who had raised him for 16 years. When Cheng Ying raises his sword, he chooses to give up on revenge with the line, “How can my benevolent hands become those of a killer like you.” But in the end, the orphan still kills Tu’an Gu in the same way that the latter killed his biological father and family. The orphan of Zhao ultimately becomes a man as cruel as Tu’an Gu. In this version, viewers can see how heroes are born, but not how hatred can be dispelled. It is difficult to expect that the goodness and nobility of individuals can eliminate the hatred in the world and human nature. This is a deeper tragedy. In extraordinary predicaments of life, struggling human nature shines and embodies tragic values in the modern sense. 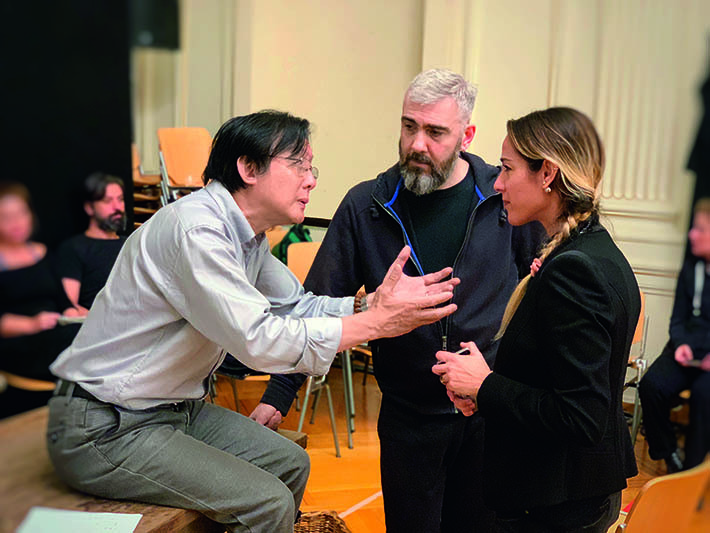 During the rehearsal of The Orphan of Zhao, director Wang Xiaoying (left) exchanges ideas with Greek colleagues. The Sino-Greek bilingual version of The Orphan of Zhao inherits the genes of two ancient drama styles and organically fuses them into a complete tragic masterpiece. A still from Richard III, directed by Wang Xiaoying. The play received abundant attention and applause when it was premiered at the London Globe during the 2012 Globe to Globe Festival. 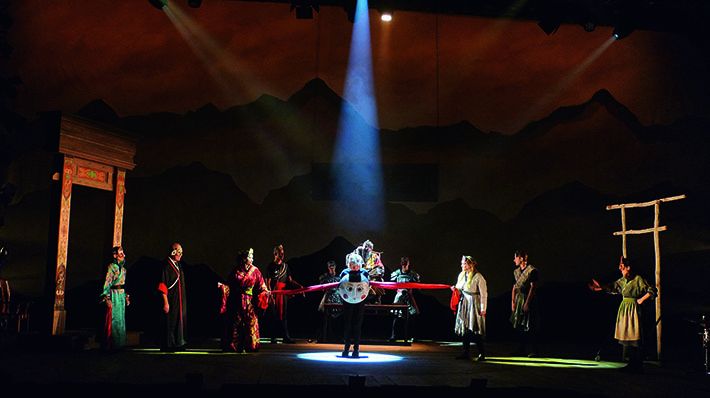 After ensuring fluency and proficiency through cooperation in performance, Chinese and Greek actors complemented each other to create a unique artistic style in The Orphan of Zhao. This highlights the true artistic value of the “cross-cultural drama.” The collision and exchange between different cultures formed a new and distinctive cross-cultural artistic language. For a long time, most Chinese dramas were performed in traditional Chinese forms on the international stage. Foreign audiences would appreciate Chinese traditional art’s long and rich history but wouldn’t grasp the modern development and vitality of Chinese dramatic arts. Chinese contemporary culture and art should not only retain its solid cultural traditions but strive to enter the international cultural context. The only solution is for the ancient and profound Chinese drama to truly take center stage in global mainstream culture. A still from The Caucasian Chalk Circle, directed by Wang Xiaoying and performed by Australian artists in 2016. The play by German modernist playwright Bertolt Brecht derived from a zaju (“variety play”) opera from the Yuan Dynasty (1271-1368) and contains many Chinese elements. The author is deputy president of China Theater Association and a renowned director from the National Theater of China.